Among all the issues demanding attention from government, this is surely the one that must claim pride of place – that is assuming that pride is an appropriate sentiment concerning such an indictment. How did we come to this? How does a country that aims to feed the world fail to keep its own citizens well-fed? The answer is that such deprivation has occurred for two main reasons; one turns on the distribution of wealth in our society, while the other reflects a long-term failure to make the most of our economic opportunities. The sad truth is that, as we have become wealthier, the greatest proportion of that increased wealth has gone to the better-off; the disadvantaged have stood still – and are now, therefore, comparatively worse off. For the poor, unemployment, low wages, inadequate social benefits, poor health and housing, higher rents and power prices, have all taken their toll. There has been a different story for the better-off. A renewed housing inflation is in effect a giant mechanism for increasing the wealth of home-owners and penalising those who must rent because they can’t afford to buy. The share of profits in our economy has continued to rise while the share for wages has fallen. Top salaries have risen fast while wages for ordinary workers have been restrained by high levels of unemployment and the failure to pay a living wage. The untaxed capital gains from property have increased purchasing power for the well-off who have also benefited from tax changes, away from direct taxation (where top rates have in any case fallen) and towards indirect taxation which hits the poor hardest. It is not the case, in other words, that we have become poorer as a society – merely that the well-off have taken the lion’s share of the economic growth of the past 30 year. But the second factor has also played its part. Despite all the euphoria occasioned by the long-delayed recovery from recession, the fact is that we have failed over a similarly long period of several decades to do as well as we should with the resources we have – and while the well-off can protect themselves from such failures, the poor bear the brunt. There can be no better illustration of our long-term failure than another piece of economic news published last week. We were invited to celebrate the fact that record commodity prices, particularly in dairy products, had allowed us to reduce our perennial trade deficit to smaller proportions. What was remarkable about this was that literally no one bothered to ask why it is that we always run such a deficit. It may sometimes be smaller and is often bigger, but it is always there. 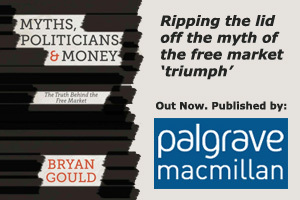 It is the best possible evidence that, despite the constant claims of successive governments that they are prudent managers of our affairs, we have simply failed – over a very long period – to pay our way. We cannot, in other words, sell enough to the rest of the world to pay for the living standards that we – or at least some of us – insist on enjoying. The consequences of this failure are far-reaching. The gap between what we can sell and what we insist on buying has to be financed in one way or another; the rest of the world will not allow us to enjoy something for nothing. We must either borrow to fill the gap, or we must sell assets. Our solution? Do both. But the problem with both solutions is that they carry with them the certainty that they will make matters worse. If we want to borrow, that means higher interest rates, and those interest payments must be paid to foreign lenders. That outflow adds to our current account deficit. So, we sell assets as well. The problem then is that a greater volume of profit is made from the larger range of assets owned by foreign owners, and those profits must again be repatriated across the exchanges. It is no accident that, at the same time as dairy prices reduced our current account deficit, it was being widened again by the sheer volume of profits being repatriated overseas. What are we doing about this? Nothing – we simply accept it as a fact of life and continue merrily on our rake’s progress. As the economy resumes growth, we don’t care a jot that the huge increase in bank credit-creation – something that the Bank of England, no less, has at last conceded accounts for virtually all the money and monetary growth in a developed economy* – goes to stimulate housing inflation rather than the increased investment in productive capacity that we desperately need. Take Courage – Remember the MAI? “Please Mr Gould, what can we do to stop it?” was a question prompted by my article in the Herald a couple of weeks ago about the risks posed to our democracy by the Trans Pacific Partnership. My first reaction was to reply “I wish I knew!” The government’s readiness to ignore public opinion if it runs counter to the interests of big business, and – as in the case of the deal over pokies with Sky City – to prevent any future government from reviewing such arrangements does not, after all, inspire much confidence that public opposition to a carte blanche for overseas corporations will have any effect. But I have had second and better thoughts – and those who have followed these issues over a couple of decades or more might understand why. We have, after all, been here before – and on that earlier occasion, governments and big business backed down in the face of public concern. We should not forget that the TPP is just the latest of the persistent attempts by global corporations (most often American) to establish a regime that allows them to pursue their own interests in any given country, irrespective of the wishes of the citizens of that country and of the policies of their elected governments. The saga begins with the power conferred on international corporates, as the global economy began to develop, to threaten national governments that, if they didn’t do what they were told, they would lose valuable investment to more compliant regimes. The subsidies demanded from our government by Warner Brothers are just one recent minor example. But that was not enough for global investors. They feared that once an investment was made, and the country concerned realised what a bad deal had been done, a future government of that country might try to reassert domestic law to ensure that national interests were properly protected. So they demanded as the price of investment in individual countries a series of Bilateral Investment Treaties whose effect was to limit the ability of both governments and courts in the host country to restrict the freedom of overseas investors to do what they liked. But even this did not go far enough. Global corporates persuaded the OECD that these bilateral treaties should be brought together in a wide-ranging international treaty which would rationalise and make uniform all such provisions and would establish the primacy of global corporate interests over national democracy right across the globe. Negotiations for this Multilateral Agreement on Investment (MAI) began within the OECD in 1995. At first sight, there was a cautious welcome for the idea; national governments saw the opportunity to restrain the freedom enjoyed by international investors to ride roughshod over local democratic interests. As the negotiations proceeded, however, it became increasingly clear that the proposed treaty was really a charter for global investors – a charter that would ensure that their operations could never be challenged either by elected governments or properly constituted national courts. It was proposed, for example, to establish a compliance regime under which “liberalisation” would always move forward, with no power to wind it back — the so-called “ratchet” effect. This would be enforced by so-called “rollback” and “standstill” provisions, requiring nations to eliminate regulations that were contrary to MAI provisions — either immediately or over a period — and to refrain from passing any such laws in the future. Compensation would have to be paid for any national rules that caused loss of profit to investors. Disputes arising under the agreement would be settled in a specially constituted tribunal instead of by the national courts of the host state. The intention was that neither governments nor affected communities could challenge the behaviour of investors, who accepted no binding obligations on themselves. Does this brief account of the central features of the MAI sound familiar? Of course it does. Not deterred by the failure of their project in 1998, global corporates have now returned to make another attempt. The MAI provisions that were – as soon as they were exposed to “sunlight” – rightly condemned and finally rejected are now central elements of a TPP being peddled as an innocent “free trade” arrangement but being negotiated in secret. The signs are growing that, like the MAI before it, the TPP is in trouble; as more information is leaked and becomes available, the chances of a secret deal being agreed over the heads of voters are falling fast. Concern is mounting in participant countries, including the US. Even our own government might be forced to think again once we are no longer kept in the dark and realise what is at stake. We still have the chance to make our voices heard. This article was published in the NZ Herald on 6 December. It is surely no accident that both Garth George and Tim Hazledine have, in the last week or two, highlighted growing inequality as a prime cause for current concern. I find that many of those I talk to share that view. It was, however, salutary to read Martin Robinson’s argument last week that growing inequality should be, if not actually celebrated, at least endorsed and justified. What was remarkable, though, was the paucity of the arguments he advanced to support his position. It was noteworthy that he did not deny that the gap between rich and poor had widened substantially; nor did he contradict the OECD’s recently published finding that inequality had grown faster here than in most other countries. And he did not explain why todays’s more unequal society is an improvement on the New Zealand which, at the same time as once enjoying one of the highest living standards in the world, was also one of the world’s most egalitarian societies. He seemed unconcerned by the increasingly strong evidence – stressed by the OECD – that widening inequality is the hallmark of societies and economies that are functioning poorly; indeed, he seemed completely unaware of the excellent research produced by the authors of The Spirit Level showing that countries where inequality is most marked – like the US and Britain – are also those which face the most intractable social and economic problems. He took refuge instead in attacking positions that no one actually holds. To deplore widening inequality is not the same thing as insisting that everyone should be paid the same, nor does it mean rewarding the idle and feckless at the expense of those who work hard. His main argument was that paying the All Blacks top salaries has made them the world-beating team they are. But All Black excellence depends on many factors, most of which have little to do with salaries; they were world leaders long before they turned professional and even today are often paid less than they would be if they went overseas. And, sadly, however much our business leaders are paid more than the rest of us, our economic performance stills fall a long way short of All Black standards. Whole societies are, in any case, much more complex undertakings than a sports team, however eminent. The ground on which Martin Robinson really seeks to stand has nothing to do with rugby. Rather, it is the belief that if the market sanctions very large salaries, then those payments must be justified, since the market cannot be wrong. It is precisely of course this touching faith in the infallibility of the market that produced our present difficulties. It was the unregulated market that brought about the global financial crisis, that continues to pay huge bonuses to failed bankers, and that exposed thousands of investors to the loss of their savings through the failure of finance companies. It is only very recently that the view that challenging the market is somehow immoral has gained credence. Even Adam Smith took an explicitly contrary view. What extreme free-market ideologues do not seem to grasp is that the unregulated market can become an instrument of oppression, since it is so easily manipulated by those who wield dominant power in the market-place. And if the market cannot be challenged, then there is nothing to prevent that dominance from being repeatedly exploited to extend that advantage, to the disadvantage of everyone else. All too often, the market’s apparent recognition of merit simply reflects the dominant position of those who walk away with the spoils. The best-paid people set each other’s salaries; and they are adept at ensuring that, while the global economy demands that working people’s wages are driven down to third-world levels, it requires that top people are paid the huge salaries that are now the norm in the international market-place. No one begrudges appropriate rewards for those whose efforts add to the general welfare. But many big earners do not create new wealth; they merely manipulate existing assets. Bankers, property speculators and even (dare one say?) foreign exchange dealers cream their fortunes off the top of assets that others have created, thereby siphoning off wealth for themselves that might otherwise have been more fairly distributed. Growing inequality of course means that the wealthy lead quite separate lives, buying themselves out of life as the rest of us live it. We gain little from them and they know even less of us. While few now give credence to the “trickle-down” theory, the flipside of the market as moral arbiter – invariably rewarding the deserving – is the belief that the poor have no one to blame but themselves. Those who manipulate the market to their own advantage enjoy not only material rewards but a sense of moral superiority as well. What the apologists for inequality do not grasp is that we are all, including the wealthy, made worse off, not only because we live in a more divided and less cohesive society, but also because – by diverting so much national wealth into so few pockets – we thereby undervalue and make poor use of the productive potential of the rest of us, so that we produce less as a country than we should. This article was published in the NZ Herald on 12 January.